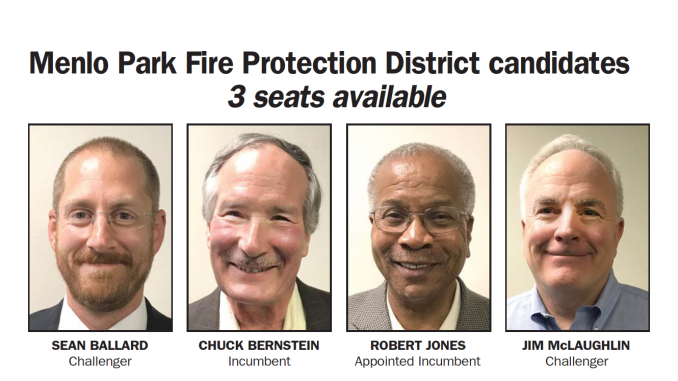 Four candidates are facing off for three seats on the Menlo Park Fire Protection District’s board, which is working to keep the district’s response times down as the area it serves grows. Incumbent Chuck Bernstein, appointed incumbent Robert Jones and challengers Sean Ballard and Jim Mc-Laughlin are the four contenders in the Nov. 6 election for the board, which oversees the district serving East Palo Alto, Menlo Park, Atherton, North Fair Oaks and West Menlo. At least one new face will be joining the five-member board because longtime board member and Atherton resident Peter Carpenter decided not to seek another term. Bernstein, a Menlo Park resident, said he is running for a second term on the board because he feels like he has only recently begun to be effective on the board, especially in terms of understanding the district’s finances. Bernstein said he’s worked hard to understand the finances of the district and, in turn, be able to explain them to reporters or members of the public who inquire about the financial standing of the district. He said it’s important to shed light on the district to the larger public. He said he has also worked to expand the amount of volunteers with the district’s Community Emergency Response Team, or CERT. Bernstein was the lone dissenting vote on the recent firefighters contract. The board approved the new contract in August, which will give firefighters up to a 22% pay increase over the next 5 years. Atherton resident Jim McLaughlin said he also would have voted against the contract if he had been on the board. He criticized the contract for giving management too much leave time and providing “proximity pay” to employees who live within a certain distance from the district. McLaughlin is currently on Atherton’s Transportation Committee, and he was part of the 19-member San Mateo County Civil Grand Jury from 2017 to 2018. The jury released a report on July 11 that asserted the fire district has been buying properties without a plan for the future and has been receiving donations from Facebook, creating a conflict of interest. McLaughlin said he decided to run after examining the district on the civil grand jury. The former CHP chief said he has experience with creating long-term and strategic plans and working with different governmental agencies, things he believes the district needs to improve on. Appointed incumbent Robert Jones is the board’s first East Palo Alto resident in 14 years and its first African-American member in its 101-year history. East Palo Alto is frequently the odd city out in being represented on the board, which is often monopolized by Menlo Park and Atherton representatives. Jones was appointed last year after board member and former firefighter Rex Ianson moved out of the district and resigned. Jones is the executive director of the East Palo Alto Community Alliance and Neighborhood Development Organization, a low-income housing nonprofit. 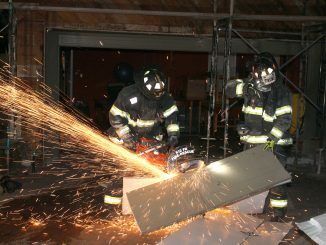 Jones has worked to bulk up East Palo Alto’s CERT team. Jones, the only board member who lives on the district’s east side, is concerned about the growth in east Menlo Park and East Palo Alto. He said the district needs to brace itself for expected development by building a “strong presence” on its east side. 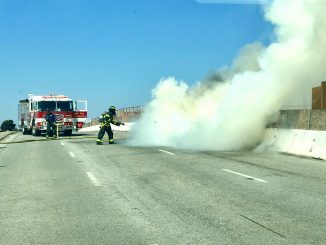 He said that includes possibly expanding Station 77 at 1467 Chilco St. in Menlo Park, or at least buying the property the station is on now. 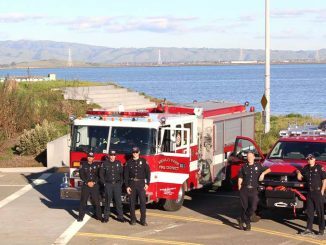 There is only one other station on the east side of Highway 101, Station 2 at 2290 University Drive. Sean Ballard, a Menlo Park resident who grew up in the city and is involved with CERT, shares Jones’ concerns and hopes to see the district and the city sit down and discuss the property. Ballard said the district would also benefit from having a sit-down conversation with the Atherton Town Council. The two entities have been at odds ever since the town decided to look into the district’s finances and realized that Atherton residents paid $11.8 million, or roughly a third of the property taxes that fund the district. Ballard, the CEO of investment consulting firm Eigenvector Capital, said he would bring an outsider’s perspective to the district. He said he would make sure the district follows through with its goals, particularly with creating its strategic plan. Ballard currently sits on the board’s strategic plan committee with Bernstein and Carpenter.